Persophone was formed in 1992. In June 1994 Iraphon, the first bass player joined and the band was completed. In November 1994 the band taped their first demo which was called 'Into The Battle'. 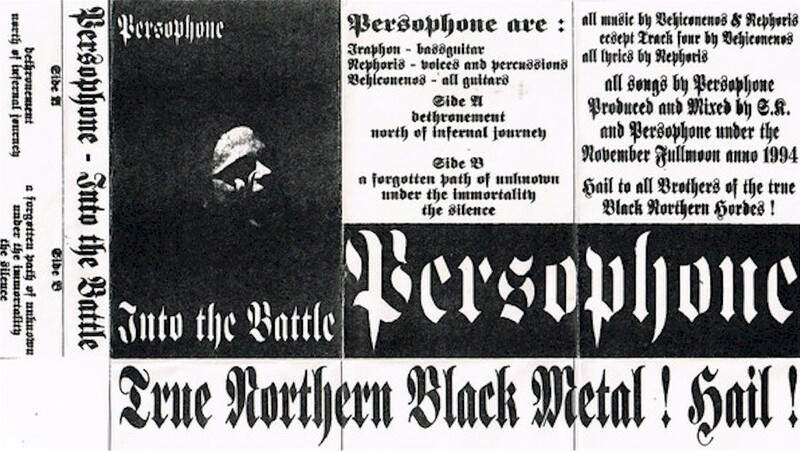 After a few lineup changes, they released their second demo in October 1995 called 'The Past Of The Nightside' and in the middle of December we released it. Xerox cover with black tape. Sold about 250 copies. Professionally printed cover with band pictures and lyrics. Professional tape without any writing.